PSA head of brands Frederic Saint-Geours: "We need to continue to push to be more international." PSA/Peugeot-Citroen head of brands Frederic Saint-Geours says the company's alliance with General Motors is just one element in the French automaker's restructuring plan. PSA also needs to reduce its over-reliance on Europe and move its Peugeot and Citroen brands more upscale to support a strong industrial presence in high-labor-cost France. Saint-Geours spoke with Automotive News Europe Editor-in-Chief Luca Ciferri. Is PSA's biggest problem that it is too European? 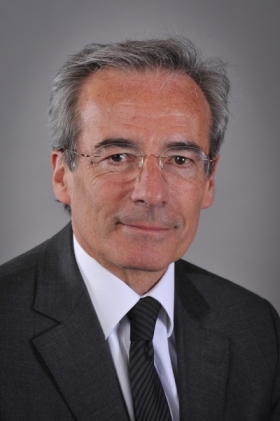 When Philippe Varin became PSA CEO he said we had three problems: too small, too mainstream and too Europe-dependent. To address size, we searched for an ally. We tried Mitsubishi, but it didn't work. Now we have General Motors. To become less mainstream, we began to make our brands more upscale. To grow internationally, we increased capacity in Latin America, opened a new plant in Russia and started a second joint venture in China. Two years ago, our sales outside Europe were 30 percent, now they are 42 percent and we aim to reach 50 percent by 2015. Are you meeting these goals? We put this strategy in place and we were right to do that because today the European market is very weak. We are suffering from this more than others for two reasons: first, we are still too European; second, we are stronger in southern European markets, which have been hit harder by the crisis than the northern part. That's why we need to continue to push to be more international. MAIN CHALLENGES: Implement alliance with GM to cut costs and regain profitability; move the Peugeot and Citroen brands upmarket; expand presence outside Europe. CAREER HIGHLIGHTS: A 26-year PSA veteran, Saint-Geours began his career at the Peugeot brand in 1986. He rose to CEO of the Peugeot brand in 1998 and joined PSA 's top-level managing board as head of finance and strategic development in 2009. In January, he was appointed to the current post of executive vice president brands. Graduated from Ecole Nationale d'Administration in Paris with an economics degree. How do you respond to VW CFO Hans Dieter Poetsch's statement that not all European carmakers, especially those in southern Europe building small cars, will survive the current crisis without government aid? We didn't ask for government help. We put in place a recovery plan for Europe. It's a courageous move because proposing to stop production in a factory in France is all but an easy move. We are not happy to do that, but we think we are obliged to. We are doing our homework. We have a 1.5 billion euro saving plan and the alliance with GM. That's what we have in our hands to be able to still be in the game in 2015. In addition, we have an offensive in terms of products, because we are not stopping our development of new models. Look at the 208. It will become the leader of its segment in Europe before year-end. Critics say the 208's success is due partly to big discounts that Peugeot began offering shortly after the model's launch. If you compare the 208's price to the Volkswagen Polo, I can tell you we are not so aggressive. Are you more worried by what VW is doing in Europe or Hyundai-Kia? When we decided to move upscale, we knew that we would be eaten up if we remained in the mass market attacked by premium brands moving down and lower-priced brands coming up from below. Having an industrial footprint in western Europe and in France, the only way to escape from this trap was to move upscale. What is PSA doing to move upscale? You do not compete on price, you compete with product. This is what we are doing by launching models such as the Citroen DS series. The same happens with the Peugeot 208, which is the front-runner of a new generation of models in terms of weight and refinement, so also here we are able to compete on product. With mainstream models that we launched two, three years ago, of course, we are obliged to compete on price. DS variants account for what percentage of total Citroen sales? Fifteen percent of the orders in Europe in the first half. In addition, we are launching the DS line in China, where the premium sector is 25 percent of the market, in unit terms that's even bigger than the premium market in Europe. We are confident that the DS line will have success in China because many Chinese investors are asking us to become DS dealers. They tell us that we are offering luxury cars from France and the Chinese love French luxury. We will also develop new DS versions specifically for China: a C-segment sedan, a D-segment sedan and an SUV. We will also sell these models elsewhere in the world, thus the expansion of the DS line in China might also help us to strengthen it in Europe. Will Peugeot also have an upscale subbrand like DS? No, our aim is to upscale the Peugeot brand in a different way. Inside every model range there will be upscale variants. Take the 208 as an example. With the 208 GT I and 208 XY variants, we are clearly up-scaling the brand. The strategy is working. More than 20 percent of Peugeot sales come from these upscale versions. How does this strategy help to increase your revenue per unit? A Peugeot 3008 and a 308 share the same platform and the same plant, but the 3008 earns three to four thousand euros more in transaction price. Clearly, we are not putting the same amount in extra content into the 3008 compared with the 308. The consumer is willing to pay this price difference because the product is clearly a fashion product. How bad is the current price war in Europe? We are in a very competitive market and competition is a little tougher than last year. That's why it's so difficult for everybody in Europe to earn money. The level of the market is very low, 25 percent below 2007, so the price war is, let's say, intense. Is PSA well positioned in segments where the price war a less intense? Today premium cars represent 20 percent of our sales. It was only 9 percent four years ago. Also, the younger your range is, the better positioned you are during a price war. We are happy because we just launched the 208 and we have several launches in very important European market segments in 2013. This will put us in in a better situation soon. Are you counting on a European market recovery to help PSA regain volumes? We assume the European market will remain at its current very low level for years to come. We are not aiming to increase market share but to maintain our current 13 percent share. Therefore, we think our plan is based on fair rather than over-optimistic assumptions. How is PSA's alliance with GM proceeding? We are on track. We signed the alliance on Feb. 29 and we have a number of things to finalize by year-end. The logistic agreement is done. Our Gefco subsidiary will be the logistic provider for GM in Europe and Russia, adding about 800 million euros a year to its revenues. We are waiting for antitrust approval in several countries to establish a purchasing JV that we hope could begin operations by year-end. Last but not least, we are working in about 15 common teams on several joint projects to develop inside the alliance. Could a purchasing JV offer significant savings even before you start building new products co-developed by the alliance? You don't need common projects to get volume and better prices in buying commodities so these kinds of synergies could come even before we develop common projects. We plan to deliver $2 billion in annual synergies. Half of these savings will come from purchasing, so clearly we will reach the full potential of purchasing synergies only when all these common projects are on stream. Will the GM alliance focus mainly on Europe or is it global? It has been global since day one. A report commissioned by the French government said that PSA would be better off closing a plant in Spain rather than in France. How do you respond? We decided to close Aulnay instead of Madrid because the Spanish plant is smaller. Moving the Madrid volumes to Aulnay will not be sufficient to take Aulnay to the right capacity utilization. In addition, costs in Spain are below those in France and we have already invested for the new product in Spain. Moving the work to France would mean re-investing, which is not a good solution. A new, additional subcompact model for Citroen. This decision was taken in 2009, which was long before we realized that the only way to reduce costs in Europe was to stop C3 production in Aulnay. Why was your other Spanish plant, in Vigo, picked as the first factory to build your Citroen C-Elysee and the Peugeot 301 budget models? We are starting in Vigo because it was the best way to be on the market as fast as possible. Spain also is one of the most effective locations to produce cars in western Europe. But these cars will be produced elsewhere to be sold in other markets, for example in China. The production of the 301 and C-Elysee in Vigo is for Mediterranean countries as well as eastern and central Europe. Why is there little demand for the Peugeot iOn and the Citroen C-Zero full-electric cars? The market for pure electric cars is not here yet. The main reason is that customers are not asking for a pure EV that you can use only in urban areas. Even in EV-friendly urban areas, the infrastructure is not developed sufficiently to give customers peace of mind when it comes to range anxiety. Next year we will add an EV variant to the Berlingo and Partner small commercial vehicles because we think that pure electric delivery vans make sense in big cities. What is you prediction for EV penetration in Europe by 2020? EVs will represent no more than 5 percent. We see hybrids at 10 percent to 15 percent and internal combustion engines at 80 to 85 percent. We have to continue investing to improve the efficiency of internal combustion engines and, where needed, couple them with different grades of electrification.